The universe has an unlimited potential for abundance. The big bang sent the stars and the matter that eventually formed you whirling into the universe and our existence continues to expand. The potential for you to be financially secure or even incredibly wealthy is out there for the taking. How can you pluck it out of the stardust? The answer may lie in your horoscope. When you work with your stars, rather than against them, you’ll find yourself better able to funnel money to yourself with more ease and understanding. If you choose to seek out and consult a qualified astrologer, make sure that you are clear about your understanding of riches and wealth. Are you satisfied if you have just enough to sustain yourself and a little more to share with those you love? Or are you happy to admit that you’d like to be rolling in money if it were at all possible and aligned with the rest of your dreams? Be straightforward with your desires and willing to be flexible with how you obtain them. Are you an earth sign like Taurus, Virgo or Capricorn, concerned with material stability? Are you the type who is likely to work hard from a grassroots beginning towards becoming the CEO of a multi-million dollar corporation, or are you the type to receive an incredibly lucky windfall like winning the lottery? Exploring your natal chart can help you answer these questions and more. Astrology can help you learn more about yourself and the personal characteristics that make you well suited to particular career paths. For instance, not every temperament can handle large amounts of money punctuating long periods of poverty. There’s even more help that can come from the sky if you follow your horoscope. For example, be careful about trading stocks when Mercury is in retrograde. Look for any planets that are retrograde or void of course when buying or selling real estate. If you have recurring projects at work, try to time them to coincide with the full moon for a rich outcome, or with the waxing moon for a slow but steadily growing capital. 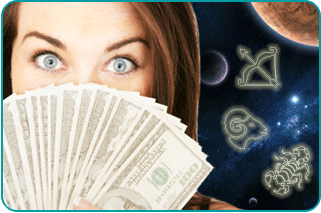 With just the shift of a few days or even hours, you can find that you’re earning more money than you were before, simply by using the timing of your horoscope. Try it for a few months and journal the difference that you see in your bank account to see that it really works. Have you ever had a moment in your life when the timing of your actions cost you a lot of money? Whether it is deciding whether to hit or stand at a game of blackjack or determining whether this is the right year to sell your house, there is a time and a place for everything. When you have access to your horoscope, you will know when to take action for rapid growth, and when it is best to sit back and count your blessings. If you’re ready for the right moment, watch for what Mars is doing in your horoscope. If you’re looking for a bull market, forget about Taurus the Bull and look to Mars for the decisive energy that you need to focus. Look to the moon for subtle actions that you can integrate into your daily interactions at work, and to Jupiter if you want to be in the place of strength while sitting back and planning strategic investments for your future. In summary, your horoscope is one of the valuable tools that you can use to increase your money and make your financial outlook brighter. It doesn’t negate the need for other external help. Your astrologer is only one part of your intuitive team. A financial planner can help you with specific banking products. And just because you have money in your stars, doesn’t mean it isn’t a good idea to plan for your retirement. Your horoscope does not replace other valuable advice. However, your horoscope can be the foundation to determine your own predispositions and it can be the scaffolding on which you can build a wealthy future.